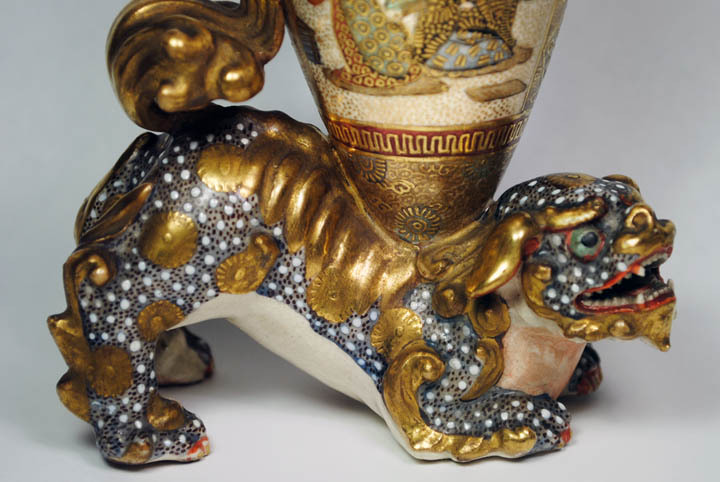 I found an attractive Satsuma-mark pottery group recently, consisting of a 6.25-inch high censer of square form, with four short feet, bulging sides, dragon handles, a cover with shishi finial, and a richly gilded figural motif. 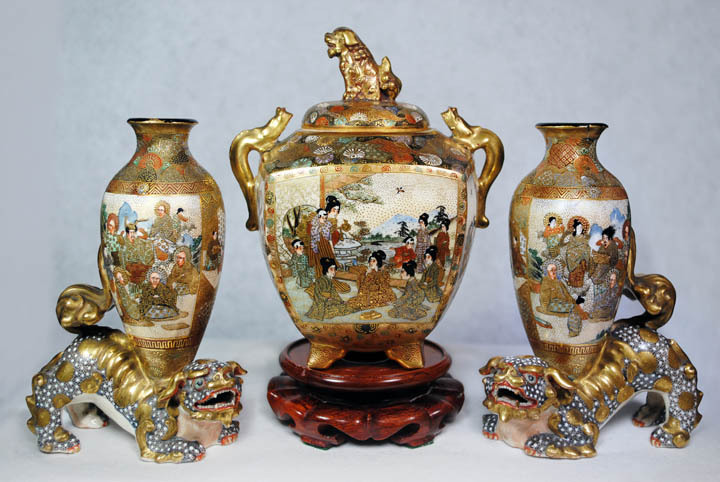 It came with two shishi bearing baluster vases with similar decoration, each a max height of six inches. The latter two pieces had been purchased with the censer in the 1970's, although the three items weren't originally a set, something the seller hadn't known until I informed her that the vase-bearing shishi and censer bore different marks, the shishi having six-character marks on their bellies of "Dai Nihon" (大日本) and what I take from online research to be the artist name Shougetsu (松月). 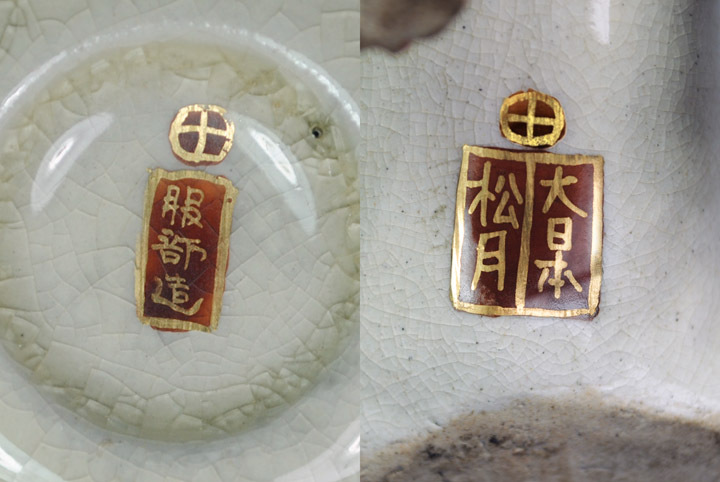 The censer has a three character mark on its underside of what I think is "Made by Hattori" (服部造- Hattori Zo). Above each mark is the Satsuma crest represented by the circled cross, Photos below. I'd appreciate confirmation of the transliteration of the Japanese names and any other comments. The pieces have a few condition problems, mainly some ill-considered restoration around the top rims, which was masked by black paint inside the mouth; the coating has begin to flake off. 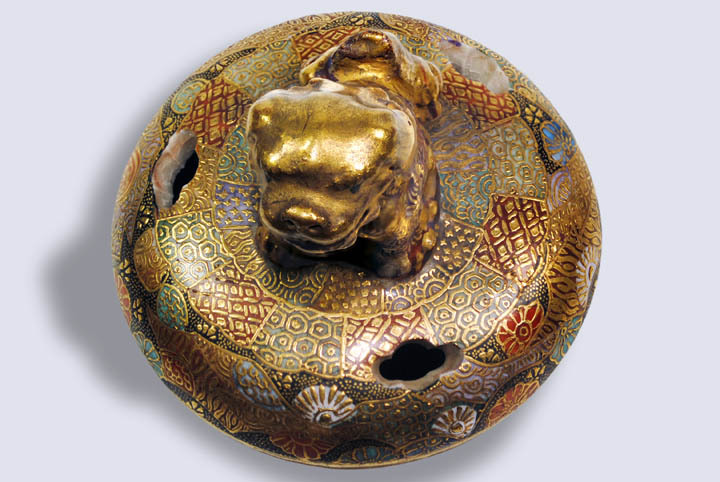 The shishi on the lid of the censer also appears to have a small repair at the very tip of his tail. But as a group, the pieces display rather well I think. 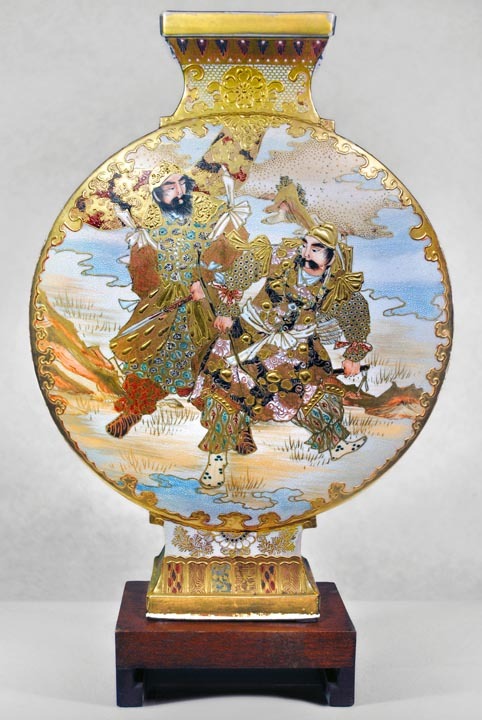 You got it all right, indeed Hattori Zo and Dai Nippon Shogetsu, Meiji Period 19th C.
Hattori Kyoho was a Chinzan School ceramic decorator and painter, who succeeded in applying new colors from Western sources in a highly painterly style since 1869. Shogetsu was a painter / decorator, who also worked for others, like Kinkozan and Choshuzan. There are marks to confirm that. I add my 2 Hattori pieces in this post, both also signed "Hattori Zo". A plate of 29 cm and a cup and saucer. Martin, thanks for your confirmation, background information and that peek at your prizes with similar marks. I've managed to acquire a goodly number of Japanese pieces over the years but shamefully have neglected researching as much of them as I do the Chinese side of my collection. 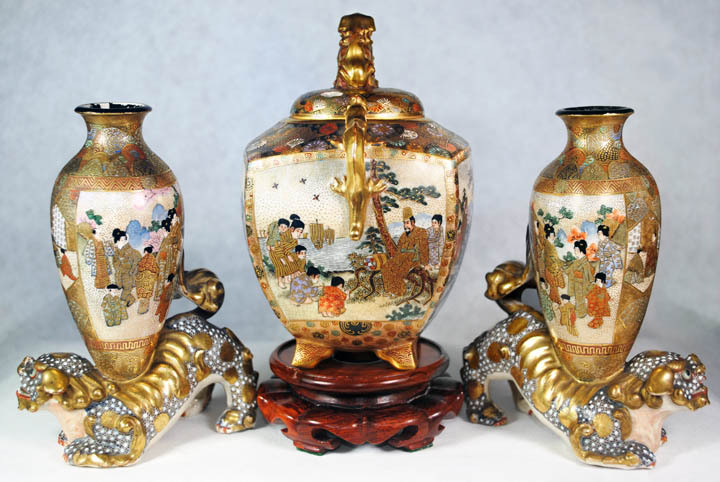 Here's one 12-inch tall vase I've spent very little time on because it has no mark but is so emblematic of late 19th century Satsuma-style wares that I think there's hardly anything left to say but 'Wow', like your Hattori items. Just another couple of pictures of these pieces. And one more of the censer's cover.